At L’Embellie, there’s no shortage of activities. Along with kayaks and fishing gear, you get a snorkeling beach right on the property, a rooftop patio, a lawn, a heated pool, and surf-wading boots. Inside, you have a TV in every room, a library, an office, and a well-equipped kitchen. The bedrooms are spread out between two buildings, so in-laws or teens can their space in a private cottage while you relax in the main house. L’Embellie Villa sits on a shallow bay with great snorkeling spots. The villa is spread out between two buildings: a two-bedroom Beach Villa and a one-bedroom Garden Cottage. The Garden Cottage is ideal for children or a third couple interested in privacy. L’Embellie is laid out like a Mediterranean oasis, with terra cotta tiles throughout and a freeform heated swimming pool between the two buildings. A bridge runs over the pool, and there’s a jumping rock where kids can practice their cannonballs. Outdoor dining areas, loungers, and umbrellas sit on both sides of the deck, and coconut palms and hibiscus are woven throughout the property. Guests can take kayaks, fishing gear, and surf-wading boots down to the bay or watch the waves roll in from the rooftop deck. In the evening, sip a cocktail while grilling the catch of the day, and feast on the back patio under the starlit sky. 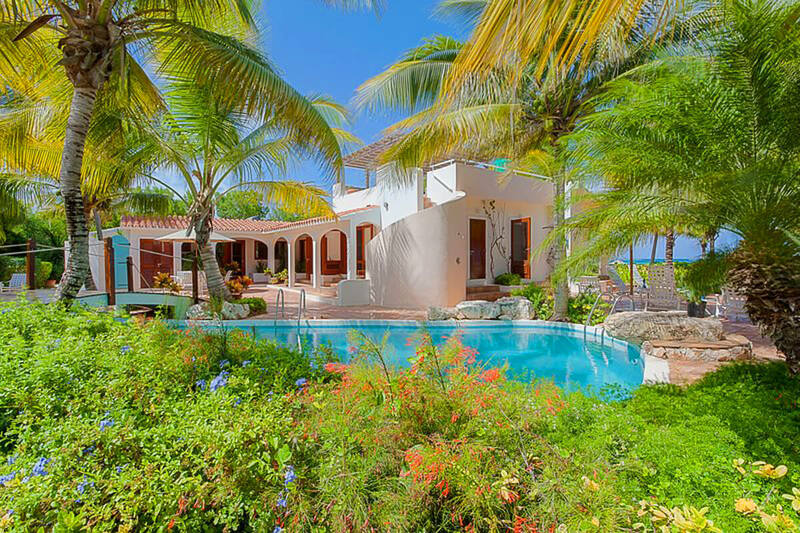 This elegant, secluded villa and cottage is set on one acre of lush tropical gardens. In the living room, there’s cable TV and a DVD player, a small study, and a library packed with books. Wood-framed glass doors open to the veranda and a short staircase leads up to the kitchen, which is equipped with standard appliances, a coffeemaker, and a blender. There’s indoor and outdoor dining off the kitchen, connected by a French door. Daily housekeeping maintains the home. Both bedrooms in the villa have king beds, ensuite bathrooms, air-conditioning, and TVs. The Master Bath opens to a garden courtyard with an outdoor shower, and the guest suite opens to the pool deck. The Garden Cottage has its own kitchenette, bathroom, and living area. It’s private terrace has a wrought-iron dining table and a cozy hammock under palm trees. The cottage suite has a queen bed, a TV, and garden views. Secluded and private, L’Embellie Villa guarantees quiet relaxation, but is within a short drive to restaurants and beaches. The Valley’s stores and restaurants are less than 10 minutes away. The beach has very shallow water with sea grass. Water shoes are suggested. It is not a good swimming beach but is great for snorkeling. Upon arrival guests will be met at the Blowing Point Ferry Terminal by a villa staff member. Once a taxi is secured (guests expense), they will follow them to the villa for an orientation of the property.